In preparation for the upcoming R workshop at the EBI, I’ve been cleaning up the rcdk package and updating some features. One of the new features is the ability to get a 2D depiction as a raster image. Uptil now, 2D depictions were drawn in a Swing window – this allowed you to resize the window but not much else. You really couldn’t use it for anything else but viewing. The latest version of rcdk and rpubchem is not on CRAN yet, but you can get source packages for OS X & Linux and binary packages for Windows at http://rguha.net/rcdk. Note that the latest version of rcdk requires R-2.11.0 along with rJava, rcdklibs, fingerprint and png as dependencies. If you’re interested in contributing check out the git repository. Rajarshi, this is very cool! 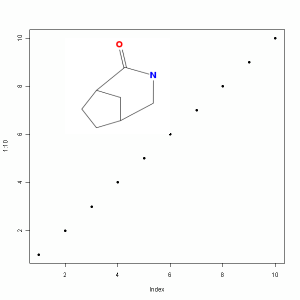 Would it be difficult to draw a line from the molecule to one of the dots? 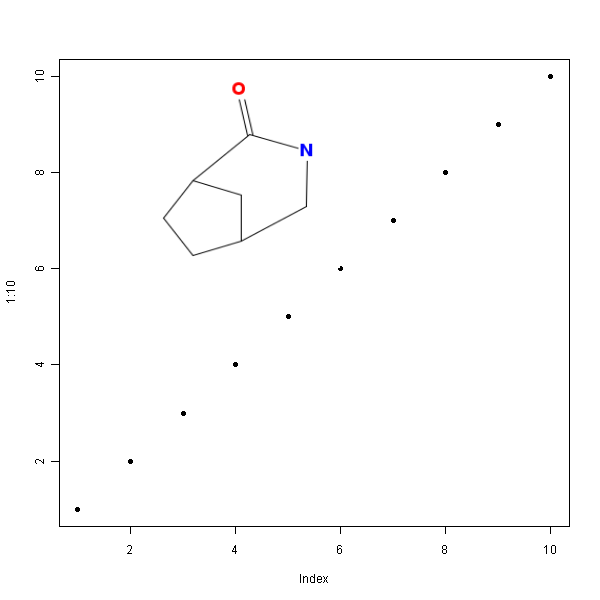 To identify molecular outliers in QSAR models? Copyright © So much to do, so little time 2019. WordPress theme by Ryan Hellyer.